Listened to a shooter extol the virtues of 44-40 as a rifle cartridge last week. When I started, folks steered me away from the round to 45 Colt. Are there any real differences in reloading or performance? Seems like apples and oranges to me. If you really enjoy cleaning your guns the 45 may be the cartridge for you. Some will say that the 44-40 is more trouble to reload but I have not found that to be true. The brass costs a little more for the 44-40 than the 45. I shoot it in my Uberti 1873 rifle and my Beretta Stampedes (black powder of course) and I love it for the historical aspect and it leaves less residue in the chamber thanks to the bottleneck design. However, it is a tiny bit easier to crumple a case mouth but if you take your time it is not really an issue. The .45 Colt was never chambered in rifles until our game became popular. I have used the 44WCF cartridge since I first started shooting CAS/SASS. I have also shot and reloaded 45 Colt. IMHO; the 44WCF is a better cartridge for our sport. The 44WCF down loads easier,you use less smokless powder, the case seals in the breach when fired. By sealing you get a better powder burn and preformance. Also the rifle action is much cleaner, even when using the Holy Black. If I were to shoot 45, I would choose the 45CS as my 45 cartridge of choice. Second choice would be 45 S&W. I now shoot Frontiersman and shoot BP & Subs in my 73/44WCF Carbine. I have not done a full disassembly clean on the piece in two Years. The bore & mag tube I clean after every match, the action stays very clean. We, who shoot the 44WCF know why Winchester never chambered the 73 or 92 in 45 Colt. It was not because the 45Colt rim was small and extraction was an issue. The dirty shooting issue is over exaggerated IMHO. True, with light bullets and low velocities, the 45 LC is not a clean shooter, but I don't see that as a big deal. Actually I use a heavier bullet, charged with a fast burning powder, which will produce a bit higher pressures, and with a good solid crimp, will shoot as clean as most others. The 44-40 is a fine caliber, and if shooting Black Powder, is a hard one to beat. Preferable to the 45 LC, if shooting Black Powder. Yes it is a bit more tedious to reload, due to the very thin brass cases, but nothing you can't manage very well. Reloading just doesn't go quite as fast. There you have it. If shooting Smokeless Powder only, I would opt for the 45 LC. For Black Powder use, or intermittent Black/Smokeless use, then the 44-40 would be my choice. Interests:What ever catches my attention. I don't find the 45 Colt dirty when loaded with Trail Boss and a 200 grain bullet. I have loaded it different powder and experienced the unburnt powder. The worst was 5744 loaded to about 650fps. I only shoot smokeless (Trail Boss) and have had no problem with the 45 colt being dirty. The cases are stained but rifle stays clean. Just looking at the cartridges the tapered 44-40 with a bigger rim "looks" like it aught to feed better in a rifle. Maybe if I had had all this info starting out I would have gone with the 44-40. I had wondered why since the 45 Colt was around when the 1873 was developed it never became a rifle cartridge until SASS came along. How does the 44-40 hold up on the progressives like the Dillon 650? I don't have a 650 but I load 3 bottle neck cartidges, 44-40 ,38-40 and 32-20 on my 550 with very little or no problems. And 44-40 on my Square Deal B with the same results. I only have shot and reloaded .45, so I can't comment on anything in comparison to the two. What I have read, on the wire and other CAS forums, is what seems to be some having trouble with the way that some Italian guns were set up with a 44/40 barrel or chambers and getting the best sized bullet for them. 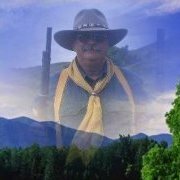 When I started I gave a strong consideration to shooting 44WCF but it was easier for me to go the path of the .45 Colt. I use APP and I really don't find any extra work in getting my guns clean. I load the 38-40 on a 650 and have no problems. It is basically a 44-40 necked down to a 40 cal. Plus when I find 44-40 cases I size then down to a 38-40. I shoot both 45lc & 44-40. Load both on a Lee 5 station progressive. Once in a blue moon I will crimp a case, or have to adjust the sizing die on the 44-40, but other than that, no problems. 44-40 does shoot a bit cleaner than the 45 LC but that may also depend on the powder used. I am a big bore shooter and enjoy both, so would be hard pressed to choose just based on caliber alone. My great grandfather carried the 44-40 in both rifle & pistol in AZ & NM and although he had a 45lc, he favored his 44-40s as his goto's. just broke the extractor on my 44-40 lever so must send it for repair. But when it comes back it will be back in service. Probably the biggest reason that Winchester never made a .45 Colt rifle was that there was real bad blood between Colt's and Winchester at the time. Patent infringement fights right and left. Centerfire cartridges WERE the high-tech, new cell phone every year, of the 1870s! Any new advance caught people's attention. Second, the folded balloon head of the .45 Colt up until about 1920, the case WAS weak and with a sticky chamber (common with BP loads) cases would have been torn up by the 73 extractor (.45 Colt was made to extract with a central extractor rod, of course). .44-40 is a premier rifle cartridge of the Old West. .45 Colt is a well functioning pistol cartridge that has been retrofit to the 73. .44-40 cases on the ground make the owners twitch with disappointment if they can't all be found and picked up. .45 Colt can be obtained used at any lost brass with a little planning and forethought. For BP, .44-40 is so much better in a rifle that it is not even worth discussing. For smokeless, .44-40 is still a better rifle cartridge, but when I shoot smokeless rifle, I prefer to drop 45 Colt cases on the ground. .44-40 will be smashed almost useless by a wayward boot heel. 45 Colt just laughs and says, "is that all you weigh?" So, two different approaches to almost the same need - a man killing, horse killing, smaller cartridge for light rifles or pistols. .45 Colt can handle a much heavier bullet when needed. So, as you can see from the discussion, there are favorites for lots of different reasons. BOth are great cartridges. Good news - you can pick and choose, or even have both. Ain't life wonderful? Don't load anything on a progressive press, so I can't comment on that. The .45 LC was originally a military revolver round. 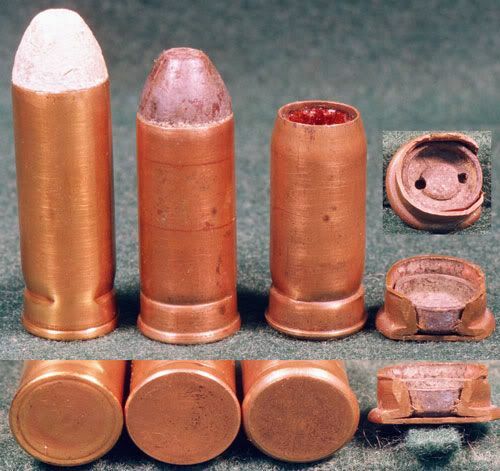 The Ordnance-manufactured cartridge was an internally-primed central fire cartridge made from gilding metal (essentially copper), rather than brass. The case was a folded head, with just enough rim to keep the cartridges from falling through the chamber. Even when the commercial companies (Winchester, Union Metallic, U.S. 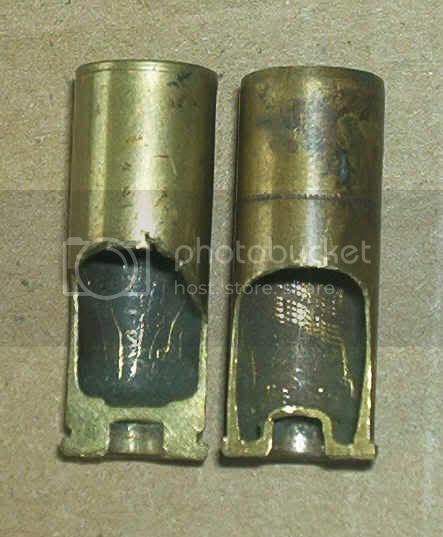 Ctg., etc) started making brass cartridge cases, the rim way very skinny. I do not have documentation to prove it, but I have no doubt that Winchester experimented with it when they were developing the '73, and found it too likely that between BP fouling, and the probability of Army personnel using the '73 with Ordnance-made rounds would have encountered a bunch of failures to extract! This would have destroyed Winchester's reputation. Instead, Winchester widened the rim, and created a slightly bottlenecked case, utilizing a .43 caliber (actually .427") diameter bullet. The result was the .44 WCF (aka .44-40). With modern brass cartridges, with most of the brass coming with a slight rebate ahead of the rim, extraction is not much of a problem in rifles. But, it is true that the .45LC brass has a thicker wall than the .44-40 brass, which is why the .44-40 obturates better with both smokeless and black. Also, the .44-40 tends to feed better, especially in the M92. There was very good reason for not having a rifle in 45 Colt. It just would not work! It was not just a battle between companies at first at least. It was design. The was nothing much for an extractor to hang onto. The only 44-40 gun I have is a Rossi "92. Factory ammo was not very accurrate, even for a poor shot like me. Based on suggestions from the good folks on the Wire, I slugged the barrel, and found the barrel to be .429, and the factory ammo to be .428. I was informed that some manufacturers are using 44 caliber barrels on their 44-40 guns. After getting ammo sized to .430, the improvement in accurracy was dramatic. If I were to get a revolver, or even another rifle in 44-40, the exact bore size of the gun would be an important issue. I have had no problems loading a .430 bullet in a 44-40 brass on my Dillon Square Deal B, just set it for a slightly larger flare for the brass. I hate big matches where they pick up the brass. By the end of the day everyone is beat. I'd rather shoot more and not worry about the brass. I buy starline 45 Colt $174.50/1000. Just checked starline 44-40 is $189.50/1000. Not much difference when I compare it to the $ I spent just to be at the match. If I were to start a cartridge selection, I would probably consider my powder selection first. For smokeless, I see no obvious reason to select 44-40 over 45 Colt. The availability of weapons and supplies in 45 seems greater and somewhat easier to obtain. IMHO, 45 Colt is an easy cartridge to load and the blow-back with smokeless was never an operational concern in rifle or pistol. A little more attention to cleaning after a match but never a problem during a match if the weapons were reasonably clean at the start. Black powder is another story. Fouling from 45's can cause serious concerns for the operation of weapons during a match if not addressed. I shoot heavy BP loads in 45's for both rifle and pistols. In my Ruger pistols, no special consideration as a Ruger. will work in any condition. Just load and shoot. Easy to clean after the match with soap and water. My rifle loads require a little attention not given to the pistol ammunition. I anneal all my rifle brass which I fine to be no big problem. I use a heaver bullet and a heavy crimp. No blow-back. I just finished a 12 stage match and my lifter and loading mechanism will not require cleaning. In fact, my lifter and total loading mechanism has not been cleaned since the start of spring shooting. I will match the cleanliness of my 73 with anyone shooting 44-40. It takes me 1 hour to anneal 200 rounds of brass which I shoot two times before re-annealing. Cleanup of my rifle take no longer than 7-8 minutes following a match to clean the barrel. I personally find it easier to anneal 45 Colt rifle brass than to deal with the loading considerations of 44-40. Others have their own opinions. Differences between individual rifles being what they are, to make categorical comparisons is laughable. I have one of the first 45 Colt Uberti 1873 imported into this country, been shooting it with BP loads since I bought it in 1986. I've seen 44WCF '73s gum up faster'n my 45. At the other end of the spectrum, a few years back EMF offered me a deal on the last Uberti Henry they were shipped, in 45 Colt. It on the other hand, gummed up faster'n anything I ever did see with BP. But, since then I've clearanced the carrier, smoothed out the carrier mortise, and using better quality BP, it is much less of a problem. BP fouling changes with, temp, humidity, granulation, load density, lube quality/amount and, maybe even how you hold your tongue while loading ammo. then loading the gun and certainly while you'reshooting! However, with smokeless, neither gun has ever hiccupped. Light loads, heavy loads (for the design), various bullet weights, from 160gr to 250s, none have ever caused me an issue. 45Colt rifles seem to be cut with near max SAAMI spec chambers. Therein lies the problem. While that allows a wide lattitude of bullets to be used, lessens any hangups on feeding, it does allow more fouling to flow back around the case without loads tailored to expand the cases to fill the available space in the chamber. Them're the facts, pure and simple. Tailor your loads to your rifle, end of problem, if there ever was one. The biggest problem with the .44-40 is the inconsistancy in chamber and especially in revolver cylinder throat dimensions! When Ruger first started making the Old Model Vaquero in .44-40, they used .44 Magnum barrels (.429" nominal groove diameter), but then throated the chambers at .425"! While the original Winchester '73's were supposed to have .427" barrels, I've seen them measure as large as .434", in a barrel that was NOT worn. Probably the first barrel made with a fresh cutting tool in the rifling machinery! Note that a .44-40 with a throat as small as .425", with a barrel .429", will shoot accurately if hard-cast bullets are used, provided, of course, that the chambers are large enough to accept a cartridge with a .430" bullet (Winchester brass thin enough to help this.) If someone has one of these and wants to ream out the throats, I recommend no larger throats than .429" or to match the actual groove diameter of the rifling. (I'm keeping my tight throats, thank you very much! I keep hearing this business about patent fights and all between Colt and Winchester, but I have never seen any thing written about it. This is why rifles were not chambered for 45 Colt until recently! Look at those rims! Do you think a rifle extractor could get a purchase on any of them? Yes, the 45 Colt cartridge was designed to be fired from a single action revolver. All that was needed was a tiny rim to keep it from falling into the chamber. The empties were poked out from inside by the ejector rod, not an extractor. The round on the left is a modern 45 Colt. All the others are oldies. Yes, the round on the extreme right could have been extracted by anything. As far as 44-40 is concerned, I keep saying this, it ain't the bottle neck shape that keeps the bore clean, it is the thinness of the brass at the neck. Only about .007 vs .012 for 44-40 vs 45 Colt. Makes all the difference in the world when shooting Black Powder, not so much with Smokeless. And yes, it is fussier to load 44-40 than 45 Colt. I always have to slow down in case a case is not seated properly in the shell plate. Slamming into the bottom of the sizing die will ruin a 44-40, a 45 Colt will just shrug off the same blow. For black powder .44-40 is the king. 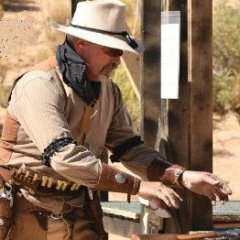 .45 is okay in the revolvers but a real problem in some rifles. I have yet to have any of my brass stretch and never have I needed to trim the brass. I think you're referring to high power loads in .30-06, 5.56, etc. Interests:God, Liberty. 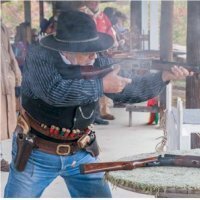 Black Powder and the Cowboy Way. God above all but I must admit the residing place for him must be in the heart of my wife and daughters. I shoot 44-40 in BP and I won't beat that horse any more. But for the 650 question I wish I could get a pard to teach me how to U-tube to this post. I use a Lee rifle charge die with a spring loaded Lee Auto disk for filler to reduce my loads in the powder cop die position on my 650 and rock out custom loads just as fast as I could 38 smokeless...Its on my mind to post a video buy send me an e-mail and I'll send you a picture and explain my set up..if you need it. Dash, I use the same setup. Works like a charm! Should have known there is not much new under the sun...thanks for being helpful...I like that about you.